The 4 days and 3 nights Chongqing to Yichang Yangtze River Cruise sails downstream along the world third longest river. People from both home and abroad are welcomed to have a fresh try of this quintessence section of the Yangtze River cruise,since so rich types of views and experiences can be encountered during the trip. No matter the especially famous Three Gorges of continuous and steep hills, appealing waterscape, well-known cultural and historical attractions, primitive natural streams,suspended coffins, local customs and culture of ethnic groups, or the world-hit Three Gorges Dam Site, unique views of vital port cities, and so forth, this golden cruise route will cover all to give the best and complete experience of the impressing Yangtze River cruise days in your tour in China. Chaotianmen Port at the junction of Yangtze River and Jialing River serves all Yangtze River cruise ships, and here you can appreciate the gorgeous night view of the modern buildings, crossing roads and bridges, and the sightseeing cruise ships all shining with colorful sparkling lights. Captain’s Welcome Party specially prepared by the cruise company will show the warm welcome from the cruise captain and all crews, and it is also a cool occasion for delicious food and drinks, dancing relaxation and friends making with others. Crew’s cabaret and evening’s amusement will extend your happy hours, with the exciting fire spitting, face changing, singing and dancing, other performances from the versatile cruise staff. The Three Gorges consisting of Qutang Gorge, Wu Gorge and Xiling Gorge boasts the impressing, magnificent and amazing natural view of high hills and flat water at the world only big gorge. Among these three gorges, Qutang Gorge is featured with the rapid rolling water at the narrow riverway, which makes it majestic and precipitous. Wu Gorge is famous for its elegant and serene sightseeing, and towering mountains surrounded by clouds and mists, deep gorge, etc. make it full of poetic romance. And Xiling Gorge is the longest one with the length of 76 kilometers in total, and the winding river, strange stones, elegant sightseeing makes Xiling Gorge another popular shining spot along Yangtze River cruise. Shennv Stream, or called Goddess Stream is 30 kilometers long and favored by tourists with its eye-pleasing landscape and the especially primitive and quiet enjoyment. The Three Gorges Dam is the largest and most complicated hydropower project worldwide, which was designed and built for the benefits of navigation, flood control, river shipping, and tourism, etc. It is an extremely popular site for the human’s project and natural sightseeing. The Ship Lift is the largest and most sophisticated ship lift in the whole world. In the year of 2019, there are totally 26 cruise ships sailing from Chongqing to Yichang. And here at below are some very popular cruise ships, recommended by us and many Yangtze River cruisers, with nice prices, high standard facilities, great services, tasteful food and beverages, rich sorts of activities, and interesting shore excursions, and so forth. 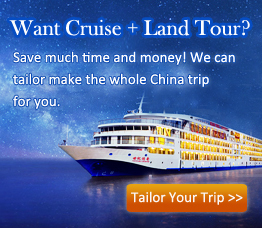 Choose your favorite one to see the details of the ship before planning your Yangtze River cruise from Chongqing to Yichang! 1. Detailed Time and Sites arranged in the itineraries and maps of each Chongqing to Yichang Yangtze River cruise ship are varied. Please check your specific favorite ship to see the detail info. 2. If you are more interested in Yichang to Chongqing Yangtze River cruise, please check the details to plan a 5 days & 4 nights Yangtze River cruise from Yichang to Chongqing, and if you want to know more information, please feel free contact our professional Travel Consultant for help.